In December 2017 we launched the Southampton to London Pipeline Project. A total of 17 corridors were developed initially, and six were then shortlisted: three in the south and three in the north. 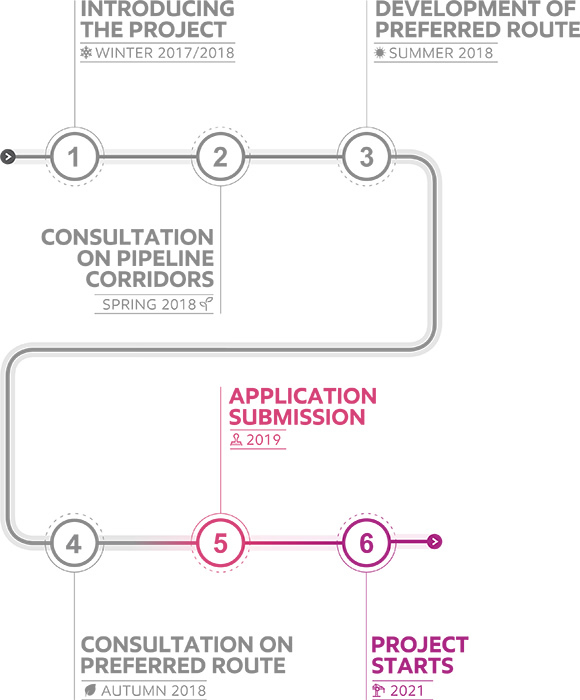 In March/April 2018, we ran a consultation where we asked for your views on the pipeline corridors. In May 2018, following an in-depth analysis of the work done to date, as well as your feedback, we selected corridors G and J to take to the next stage. When combined, these formed the single preferred corridor. In June 2018, we released an initial working route that followed the preferred corridor and was developed by reviewing the available local technical data. It was an early view of where we might seek to install the pipeline. In September/October 2018, we ran a consultation where we asked for your views on a preferred route and sub-options along the preferred route. This consultation also included an early indication of potential environmental impacts and mitigations. In January/February 2019 we ran a consultation seeking views on design refinements that may have different potential impacts for landowners, the environment and communities than our previous proposals. We have now released the final route that we will include within our application to the Planning Inspectorate in late spring 2019 (subject to our continued compliance with the Planning Act 2008). For those who may be affected by the route for the replacement pipeline, our land agent team, Fisher German LLP will be in touch to provide project updates and key information as the project progresses. Visit our page for landowners to find out more.